Black Bean Soup With Hocks – Stahl-Meyer Foods, Inc. 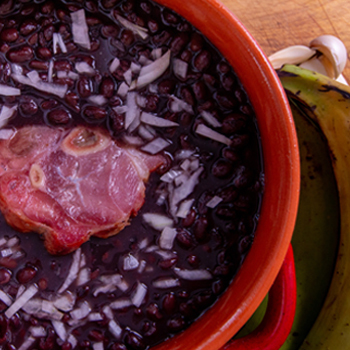 Pick through the dried black beans and soak in cold water to cover overnight. Drain and rinse well. In a large pot, saute onions and green peppers in olive oil over medium heat until the vegetables are softened, about 10 minutes. Add the garlic, cumin, cumin seeds, oregano, and bay leaves, and cook for an additional minute. Add water or stock, ham hocks, and soaked beans to the pot. Bring it to a boil, then lower to a simmer, covered, stirring occasionally, and cook until the beans are tender and the soup is thickened, about 1.5 hours. Remove the ham hocks and let cool. Remove and discard the ham bone. Shred the meat and return it to the pot. Stir in cilantro and lime juice, and heat through. Season with salt and pepper to taste. Serve hot.